We thought we’d seen all of the Divergent character posters showing off the Dauntless’ love of tattoos, but then came Peter. 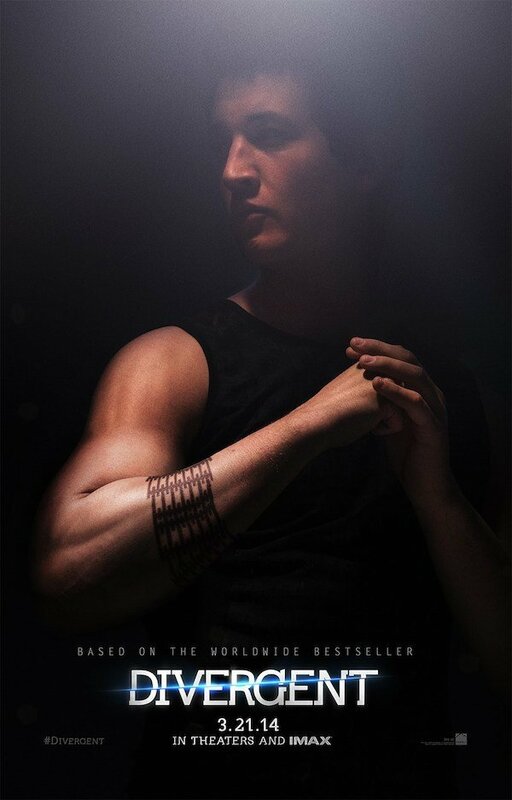 Miles Teller’s character is front and center in the latest character poster, which reveals the tattoo cuff around his forearm. It’s tough looking, which is fitting for a character like Peter. To say he’s tough would be an understatement. Brutal might be more fitting, but that teeters into spoiler territory, so we’ll stop there. Dauntless people are tough by nature. Of the five factions that exist in the dystopian Chicago setting of Veronica Roth’s novels, they’re the toughest, in fact, known for their bravery. Just as the story’s lead character Tris (Shailene Woodley) is transferring in to Dauntless from another faction at the start of the story, so is Teller’s Peter. While Tris comes from Abnegation, a faction known for its selflessness, Peter comes from Candor, a faction known for people who speak their mind. Also from Candor is Christina (Zoe Kravitz), but unlike Peter, Christina and Tris actually get along. You can check out Christina’s tattoo poster (and the other character posters) here. Miles Teller was the funny guy in Footloose, but it’s probably safe to assume he won’t be the funny guy in Divergent. That’s just fine though, as Teller has proven to have a pretty vast range as an actor, having appeared in dramas including Rabbit Hole and The Spectacular Now, the latter of which put him opposite Woodley. Speaking of Woodley, she’s featured in this Instagram video in costume (and tattoos!) to announce that a new trailer is on the way in three days. So that’s one more thing to look forward to coming soon, though the film’s arrival is still months away, with a release date of March 21, 2014.